Jamgön Ju Mipham, or Mipham Jamyang Namgyal Gyamtso (1846–1912) (also known as "Mipham the Great") was a very influential philosopher and polymath of the Nyingma school of Tibetan Buddhism. He wrote over 32 volumes on topics such as painting, poetics, sculpture, alchemy, medicine, logic, philosophy and tantra. Mipham's works are still central to the scholastic curriculum in Nyingma monasteries today. Mipham is also considered one of the leading figures in the Ri-me (non-sectarian) movement in Tibet. His two models of the two truths doctrine, Fourfold pramana (valid cognition), Unity of purity and equality. "Ju" ("holding") was Mipham's family name as his paternal clan is said to have originated as clear light deities who came to the human world holding a rope. "Jamgön" (Skt. Mañjuśrī) indicate that he was considered to be an emanation of the bodhisattva Mañjuśrī. His maternal uncle, Minister-Lama Drupchok Pema Tarjay, named him Mipham Gyamtso ("Invincible Ocean" or "Unconquerable Ocean"). In Tibetan literature, the word "mi-pham" is the standard translation of the Sanskrit "ajita", meaning "unconquered", which is a common epithet of the celestial bodhisattva Maitreya. Mipham the Great was born to an aristocratic family in 1846 in the Derge Principality of Kham or Eastern Tibet. He was recognized as an exceptional child from a young age, memorizing texts as early as age six. By the age of ten he had already composed many texts. At twelve, he entered the monastery as an ordinary monk of the Ogmin Urgyen Mindrolling lineage at a branch monastery of the great Nyingma seat Shechen. When he was fifteen or sixteen, after studying the very difficult Mindrolling system of chanting for only a few days and praying to Manjushri, he is said to have completely mastered it. In an 18-month retreat he accomplished the form of Manjushri known as 'Lion of Philosophers' (Tibetan: smra ba'i seng ge), using a liturgy composed by the fifteenth Karmapa, Khakhyab Dorje. He made many medicinal pills blessed with Manjushri's mantra, and many miraculous signs were said to have been manifest. After this, it was said that he could accomplish any sutra or tantra without any effort, and no text was unknown to him. He went to many lamas to obtain the necessary lungs (oral transmissions), but he needed no study or teachings for any texts. Mipham was "a luminary of the nineteenth century Nyingma renaissance and Rime movement ecumenical movement, which started in the Kham region of eastern Tibet". As such he received teachings from masters of all lineages Nyingma and Sarma alike. His root gurus were Dza Patrul Rinpoche, from whom he received instruction on Shantideva's Bodhicharyavatara and Dzogchen and the renowned master Jamyang Khyentse Wangpo, from whom he received transmission of the orally transmitted or Kama and revealed or Terma lineages, and many other teachings. His other teachers included Jamgon Kongtrul Lodro Thaye; Dzogchen Khenpo Padma Vajra; Lab Kyabgon Wangchen Gyerab Dorje; Jubon Jigme Dorje; Bumsar Geshe Ngawang Jungne and Ngor Ponlop Jamyang Loter Wangpo. A key theme in Mipham's philosophical work is the unity of seemingly disparate ideas such as duality and nonduality, conceptual and nonconceptual (nirvikalpa) wisdom, rational analysis and uncontrived meditation, presence and absence, immanence and transcendence, emptiness and Buddha nature. Mimicking the Sarma schools, Mipham attempted to reconcile the view of tantra, especially Dzogchen, with sutric Madhyamaka. This was in departure with the Nyingma school which generally positioned the view of tantra as superior to the view of Madhyamaka. For Mipam, the unity of philosophical views is ultimately resolved in the principle of coalescence (Sanskrit: yuganaddha, Tib: zung 'jug), which is the nonduality of conventional and ultimate realities, of samsara and nirvana. Unlike Tsongkhapa who held that emptiness, as an absolute negation, was the definitive reality and view, Mipham sees coalescence of gnosis and emptiness, form and emptiness, etc. as "the ultimate hermeneutical cornerstone of his interpretations". In his many texts Mipham explores the tension and dialectic that arises between philosophical reasoning of the ordinary mind (rnam shes) which is represented by the Madhyamaka philosophy and luminous nonconceptual wisdom (ye shes), which is the focus of the teachings of Dzogchen. He attempts a synthesis of them to show that they are not incompatible perspectives and that the teachings of Dzogchen are in line with reason. Mipham developed a twofold model of the Buddhist two truths doctrine. The first model is the traditional Madhyamaka perspective which presents the two truths of emptiness and appearance, with emptiness representing the level of ultimate truth and appearance representing relative truth. In this model the two truths are really the same reality and are only conceptually distinct. In his second model of the two truths, Mipham presents an authentic truth and an inauthentic truth. Authentic experience is any perception that is in accord with reality (gnas snang mthun) and perceptions which do not are said to be inauthentic. This differs from the first model because in the first model only emptiness is ultimate while in the second model the ultimate truth is the meditative experience of unitary wisdom. Instead of just being a negation, it includes the subjective content of the cognition of wisdom as well as the objective nature of reality. In this model the ultimate truth is also reality experienced nonconceptually, without duality and reification, which in Dzogchen is termed rigpa, while the relative truth is the conceptual mind (sems). The emptiness taught in the middle wheel and the exalted body and wisdom taught in the last wheel should be integrated as a unity of emptiness and appearance. Without dividing or excluding the definitive meaning subject matters of the middle and last wheels, both should be held to be the definitive meaning in the way of just this assertion by the omniscient Longchen Rapjam. - Lion's Roar, exposition of Buddha nature. For Mipham, both of these teachings are definitive and a middle way between both of them is the best way to avoid the extremes of nihilism and essentialism. As scholar Robet Mayer remarks, Mipham "completely revolutionised rNying ma pa scholasticism in the late 19th century, raising its status after many centuries as a comparative intellectual backwater, to arguably the most dynamic and expansive of philosophical traditions in all of Tibetan Buddhism, with an influence and impact far beyond the rNying ma pa themselves." Mipham's works on both the exoteric or Sutrayana teachings and the esoteric or Vajrayāna teachings have become core texts within the Nyingma tradition. These works now hold a central position in the curriculum of all Nyingma monasteries and monastic colleges — occupying a place of esteem similar to the works of Sakya Pandita and Gorampa in the Sakya tradition; those of Tsongkhapa in the Gelug tradition and of Kunkhyen Padma Karpo in the Drukpa Kagyu. Together with Rongzompa and Longchenpa, Mipham is considered to be one of the three "omnscient" writers of the Nyingma tradition. Although Mipham wrote on a wide range of subjects, Prof. David Germano identifies the most influential aspect of Mipham's career in that he "was the single most important author in the efflorescence of Nyingma exoteric literature in the nineteenth and twentieth centuries. Grounding himself theoretically in the writings of Longchenpa and other great Nyingma authors, Mipham produced brilliant exegetical commentaries on the great Indian philosophical systems and texts with a Nyingma orientation.". E. Gene Smith also judged that Mipham's greatest contribution was "in his brilliant and strikingly original commentaries on the Indian treatises." Prior to Mipham, Nyingmapa scholars "had seldom written detailed pedagogical commentaries on the śāstras of exoteric Buddhism." Until his time the colleges or shedra associated with the great Nyingma monasteries of Kham, such as Dzogchen, Shechen, Kathog, Palyul and Tarthang lacked their own exegetical commentaries on these exoteric Mahayana śāstras, and students commonly studied Gelug commentaries on these fundamental texts. Grounding himself in the writings of Śāntarakṣita, Rongzom Chokyi Zangpo, and Longchenpa, Mipham produced a whole array of brilliant exegetical commentaries on the great Indian philosophical systems and texts that clearly articulated a Nyingma orientation or view. The texts include his commentaries on the Mulamadhyamakakarika or Fundamental Stanzas on Wisdom by Nagarjuna; the Introduction to the Middle Way (Sanskrit: Madhyamakāvatāra) of Chandrakirti; the Quintessence of all Courses of Ultimate Wisdom (Jnanasarasamuccaya) of Aryadeva; commentaries on the major works of the Indian Buddhist logicians Dharmakirti and Dignaga; commentaries on the Five Treatises of Maitreya most notably, the Abhisamayalamkara; commentaries on several works of Vasubandhu including the Abhidharmakosha. Miphams commentary on the ninth chapter of Shantideva's Bodhicaryavatara, the Shertik Norbu Ketaka (Tibetan: ཤེར་ཊཱིཀ་ནོར་བུ་ཀེ་ཏ་ཀ་, Wylie: sher ṭīk nor bu ke ta ka), "threw Tibetan scholarly circles into several decades of heated controversy," but "it was not the only tempest Mipham's new expositions raised." His commentary on the Madhyamakalamkara of Śāntarakṣita was also considered highly controversial. Mipham's commentary on the Guhyagarbha Tantra is entitled The Essence of Clear Light or Nucleus of Inner Radiance (Wylie: od gsal snying po)— it is based on Longchenpa's commentary, Dispelling Darkness in the Ten Directions Wylie: gsang snying 'grel pa phyogs bcu mun sel which explains the Guhyagarbha from the Dzogchen point of view. Mipham showed particular interest in the Kalachakra and the kingdom of Shambhala, and one of his last and most extensive of his esoteric works are his two volumes of commentary, initiation and sadhana related to the Kalachakra Tantra, the esoteric teaching from Shambhala. Before he died in 1912, he said to his students that now he was going to Shambhala. Throughout his life, Mipham showed a particular interest in the legend of the warrior king Gesar of Ling, a 12th-century figure whose epic is well-known and widely celebrated in eastern Tibet, and about whom Mipham wrote extensively. The Gesar practice, known as "The Swift Accomplishment of Enlightened Activity Through Invocation and Offering" (Wylie: gsol mchod phrin las myur 'grub) arose in the mind of Mipham as a gong-ter and was written down over the course of 3 years from the age of 31 to 34. This practice invokes Gesar and his retinue and requests him to assist practitioners. Mipham's medical works continue to be highly regarded to this day. Mipham also wrote extensively about astrology which was, in his words, a "delightful game" that he mastered in his teens but later applied to more serious topics such as medicine; these two topics, with various texts on more or less related topics of divination, occupy perhaps 2,000 pages of his writing. An entire volume of Mipham's is devoted to Ju-thig or divination using knots, a method that might be termed "Bon" in origin, for want of a more accurate term; this may have been the legacy of his family, who were doctors for several generations. Throughout his writings there are many resources for divination, in addition to astrology, including several rituals for looking in mirrors (pra-mo), one using dice (mo), pulling different-length 'arrows' (Wylie: da dar) out of a quiver and so on, compelling a non-human "bird" to whisper future news in one's ear, and so on. In one short text he prescribes various methods of divination (all drawn, Mipham emphasizes, from Tantric scriptures and commentaries) that make use of unusual sources of augury such as: the vicariously overheard chatter of women; sudden appearance of various animals, especially birds; weather phenomena; the shape, size and color of flames in the agnihotra or fire puja; the quality of burning butter lamps, especially the size of the flame, the amount and shape of smoke that arises; and the size and shape of the carbon deposit on the wick. When some of his scholarly rivals thought it inappropriate for a monk to devote so much time to matters of future events, Mipham wrote a short essay explaining the purpose of divination, citing sources in the Sutras and Tantras where the utility and value of divination are explained. Mipham’s most important students were Dodrub Rinpoche, Terton Sogyal, the Fifth Dzogchen Rinpoche, Gemang Kyab Gon, Khenpo Padmavajra, Katog Situ Rinpoche, Sechen Rabjam, Gyaltsab Tulku, Palyul Gyaltrul, Karma Yangtrul, Palpung Situ Rinpoche, Ling Jetrung, Adzom Drukpa (1842-1924), Togdan Shakya Shri, Ngor Ponlob, and others. The great tulkus of Sechen, Dzogchen, Katog, Palyul, Palpung, Dege Gonchen, Repkong and others of all lineages, Sakya, Gelug, Kagyu, and Nyingma, all became his disciples. Now I shall not remain long in this body. After my death, in a couple of years hence, war and darkness shall cover the earth, which will have its effect even on this isolated snow land of Tibet. In thirty years time, a mad (smyo) storm of hatred will grow like a fierce black thundercloud in the land of China, and in a further decade this evil shall spill over into Tibet itself, so that Lamas, scholars, disciples and yogis will come under terrible persecution. Due to the demon-king Pehar taking power in China, darkness and terror ('bog) will come to our sacred land, with the result that violent death shall spread like a plague through every village. Then the three lords of materialism (gsum-gyi-kla-klos) and their cousins will seize power in Tibet, spreading war, famine and oppression. No one will be safe. Now, very soon, my mind-stream will be gathered up in the pure-land of Tusita, from whence many emanations [of myself] shall then come forth in future years. I shall not take rebirth in Tibet. In twenty years, seek me in the northern lands of distant Uttarakuru, and elsewhere, east, west, north and south. Fear not, we shall be re-united again, as father and son. Now go! In the above account, shortly after the departure of Khenpo Kunphel he stated publicly, "Now, soon I shall depart. I shall not be reborn again in Tibet, therefore do not search for me. I have reason to go to Shambhala in the north." Subsequently, a number of emanations have been recognized. According to E. Gene Smith "At least three rebirths were recognized in the decade following his death: 1) Zhe chen Mi pham (a grandnephew of Mi pham rgya mtsho); 2) Tshe dbang bdud 'dul (1915/16-42) the last prince of Sde dge; 3. Khyung po Mi pham, an incarnation recognized by Rdzong gsar Mkhyen brtse 'Jam dbyangs chos kyi blo gros." The next (third) Mipham in the line of the Dege Prince who died in 1942 was apparently born in Tibet in 1949 and recognised by Tengye Rinpoche of Lab i 1959 At that time he was enthroned and given responsibility for all monasteries previously held by the first and second incarnations. This third incarnation was also confirmed by Patrul Rinpoche who gave him relics of the previous incarnations and by Dilgo Khyentse Rinpoche, who he had recognized in a previous incarnation. This Mipham incarnate is the father of Thaye Dorje, one of two candidates to be recognized as the 17th Karmapa, and of 14th Sonam Tsemo Rinpoche, an important Gelug/Sakya tulku. In 1995, Ösel Rangdröl Mukpo (b. 1962), the eldest son of renowned dharma master Chogyam Trungpa Rinpoche and Ani Könchok Palden, was recognized as a reincarnation of Mipham Rinpoche by HH Drubwang Padma Norbu Rinpoche, at the time the head of the Nyingma lineage. He is now known as Sakyong Mipham Rinpoche, and is the spiritual head of Shambhala International. It should be noted that in contemporary scholarship, the nomenclature "Mi-pam" and "Mipam" has become an accepted alternative. Writers such as Hopkins and Duckworth have adopted this convention (see below). Mo: The Tibetan Divination System. Translated by Jay Goldberg. Snow Lion 2000. The Blessing Treasure: A Sadhana of the Buddha Shakyamuni by Mipham Rinpoche. A Commentary by Khenchen Palden Sherab Rinpoche & Khenpo Tsewang Dongyal Rinpoche. Dharma Samudra 2009. The Wheel of Analytic Meditation, in "The Collected Works of Dilgo Khyenste", Vol. 2. Shambhala 2010. Essence of Clear Light: An Overview of the Secret Commentary "Thorough Dispelling of Darkness throughout the Ten Directions". Trans. Light of Berotsana. Snow Lion 2010. Unending Auspiciousness: The Sutra of the Recollection of the Noble Three Jewels, with Commentaries by Ju Mipham, Taranatha and the Author. Trans. Tony Duff. PKTC 2010. The Verses of the Eight Noble Auspicious Ones. CreateSpace 2013. Ornament of the Great Vehicle Sutras: Maitreya's Mahayanasutralamkara with Commentaries by Khenpo Shenga and Ju Mipham. Trans. Dharmachakra Translation Committee. Snow Lion 2014. Shower of Blessings. Yeshe Gyamtso. Ktd Publications 2015. The Wheel of Investigation and Meditation that Thoroughly Purifies Mental Activity and the Lamp That Dispels Darkness in "Pith Instructions: Selected Teachings and Poems". Dilgo Khyentse. Shambhala 2015. (Only available as eBook). A Garland of Views: A Guide to View, Meditation, and Result in the Nine Vehicles. Padmakara Translation Group. Shambhala 2016. The Just King: The Tibetan Buddhist Classic on Leading an Ethical Life. Translated by Jose Cabezon. Shambhala 2017. The Wisdom Chapter: Jamgön Mipham's Commentary on the Ninth Chapter of The Way of the Bodhisattva. Translated by The Padmakara Translation Group. Shambhala, 2017. Mipham's Sword of Wisdom: The Nyingmapa Approach to Valid Cognition. Khenchen Palden Sherab. Wisdom Publications 2018. A Feast of the Nectar of the Supreme Vehicle: An Explanation of the Ornament of the Mahayana Sutras. Padmakara Translation Group. Shambhala 2018. Wondrous Talk Brought about by Conversing with a Friend; the Four Dharma Traditions of the Land of Tibet; Profound Instruction on the View of the Middle Way; the Essence of Mind; the Essence of Wisdom: How to Sustain the Face of Rigpa; the Nature of Mind; Lamp to Dispel Darkness; and Advice to the Dodrup Incarnation, Jigme Tenpe Nyima in "Beyond the Ordinary Mind: Dzogchen, Rimé, and the Path of Perfect Wisdom". Translated by Adam Pearcey. Snow Lion, 2018. Lotsawa House - Mipham Rinpoche Series - Translations of several texts by Mipham Rinpoche. Song of the Debate Between Wake and Dream A short teaching by Mipham Rinpoche. ^ Reginald A. Ray; Indestructible Truth: The Living Spirituality of Tibetan Buddhism, 2002, chapter 9. ^ Duckworth, Mipham on Buddha Nature, xiii. ^ a b Koppl, Heidi. Establishing Appearances as Divine. Snow Lion Publications 2008. ^ Pettit, John W; Mipham's Beacon of Certainty: Illuminating the View of Dzogchen, the Great Perfection. Studies in Indian and Tibetan Buddhism (Volume II), 2002, page 4. ^ Pettit, John W; Mipham's Beacon of Certainty: Illuminating the View of Dzogchen, the Great Perfection. Studies in Indian and Tibetan Buddhism (Volume II), 2002, page 131. ^ Duckworth; Jamgon Mipam, His life and teachings, Pg 78. ^ Duckworth; Jamgon Mipam, His life and teachings, Pg 81. ^ Duckworth; Jamgon Mipam, His life and teachings, Pg 82. ^ Duckworth, Jamgon Mipam, His life and teachings, 145. ^ Duckworth; Jamgon Mipam, His life and teachings, Pg 85. ^ Duckworth; Jamgon Mipam, His life and teachings, Pg 87-88. ^ Curren 2006: "Buddha's not smiling", Delhi: Motilal Banarsidass, 225. Germano, David (2002). "A Brief History of Nyingma Literature". THDL. Archived from the original on 2008-06-05. Retrieved 2008-08-27. Goodman, Steven (1981). "Mi-pham rgya mtsho: An Account of His life, the Printing of His Works, and the Structure of His Treatise entitled mKhas pa'i tshul la 'jug pa'i sgo". Windhorse (I). Pettit, John Whitney (1999). Mipham's Beacon of Certainty: Illuminating the View of Dzogchen, the Great Perfection. Boston: Wisdom Publications. ISBN 0-86171-157-2. Phuntsho, Karma (2005). Mipham's Dialectics and Debates on Emptiness: To Be, Not to Be or Neither. Routledge Critical Studies in Buddhism. London: RoutledgeCurzon. ISBN 0-415-35252-5. Smith, E. Gene (2001). Among Tibetan Texts: History & Literature of the Himalayan Plateau. Somerville MA: Wisdom Publications. ISBN 0-86171-179-3. Dharma Fellowship of HH the Gyalwa Karmapa. "The Life of Mipham Jamyang Namgyal (1846–1912)". Dharma Fellowship of HH the Gyalwa Karmapa. Retrieved 2008-08-27. Root text of "Umajen" or "Madhyamakalamkara" by Shanta Rakshita. Commentary ("Jamyang Gyepai Zhalung") by Mipham Rinpoche. Duckworth, Douglas (2008). Mipam on Buddha-Nature: The Ground of the Nyingma Tradition. Albany NY: SUNY Press. ISBN 978-0-7914-7521-8. Duckworth, Douglas (2011). 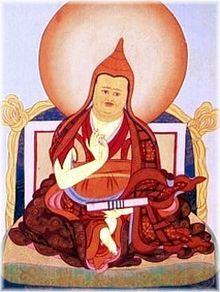 Jamgön Mipam: His Life and Teachings. Boston MA: Shambhala Publications. ISBN 1590306694. * Duckworth, Douglas (2014). "Non-Representational Language in Mipam's Re-presentation of Other-Emptiness".